Bainbridge International, the original sailcloth manufacturer and distributor of hardware and marine canvas products for 100 years, is proud to announce the appointment of Erik Reynolds to the position of the Sailmaking & Marine Hardware Sales Representative for the important West Coast territory, based at our Huntington Beach, CA facility. Erik has been in and out of sail lofts and on and off sailboats since birth. The nephew of a sailmaker, Erik grew up on the Chesapeake Bay where he began sailing and racing at a young age, all the while having a natural ability to teach sailing to those who needed help or looked for ways to improve. Sailing collegiately for ICSA Hall of Fame member Dan Winters at Christopher Newport University only increased his knowledge and skill set in sailboat racing, management, instruction, cruising and sailmaking. 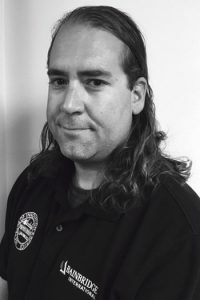 Erik has worked as a professional sailor and sailmaker, at boat builders, as a collegiate and high school sailing coach, at sailing schools, summer camps, youth programs and non-profit organizations. Working with sailors and students with a variety of skill levels in just about every sailing setting imaginable. From Lasers, 420s & FJs to J-boats and Offshore Classes, he brings a wealth of sailing, racing and boating experience that can only improve the team and help drive success at Bainbridge International. Erik also gives support back to sailing organizations by giving and attending lectures, clinics and camps, working on race and protest committees and even serving as an umpire at a few sailing events in his career. Erik is very excited about the opportunity to work with all the sailors, clients and the staff at Bainbridge International. His door is always open for new ideas, insight or a day out sailing and welcomes all sailors no matter what experience they may have or diverse port they may hail from.